New emoji support has appeared for the first time in iOS for 2018 with today's release of the iOS 12.1 beta 2 for developers. Update: iOS 12.1 was released to the general public on October 30, 2018. See every emoji in the final version or view the most discussed emojis from this release. First previewed by Apple in July, this is the first time some additions such as the skateboard, hiking boot and foot have been shown. Other additions seen in July's preview include the popular red hair and curly hair additions, as well as the softball, kangaroo, and llama. 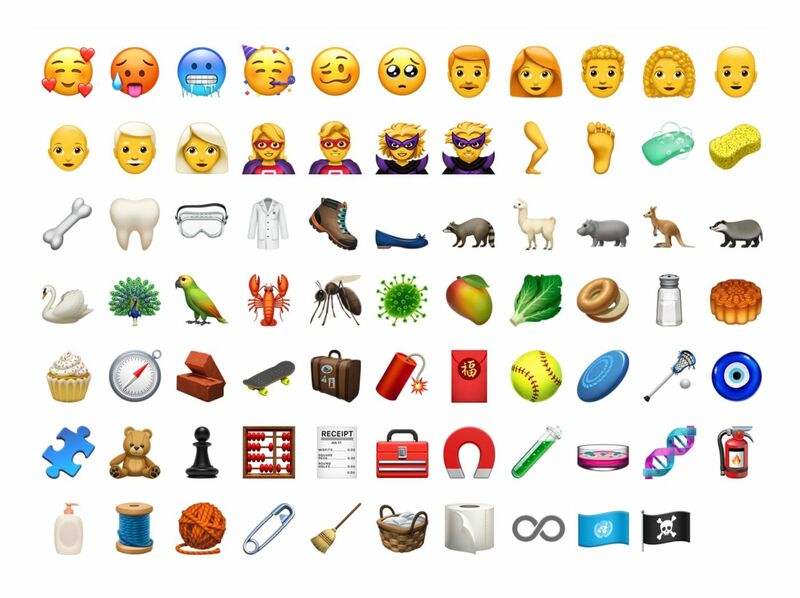 Above: All of the new emojis in iOS 12.1. Skin tone variations are included, but not displayed here. Images: Apple iOS 12.1 beta / Emojipedia composite. This is the first version of iOS to support Emoji 11.0, which was released by Unicode in June 2018. Apple bills this as "over 70" new emojis; while the total tally is 158 when all gender and skin tone sequences are taken into account. Note that if viewing this list on a platform which doesn't support these emojis, each character may show as a symbol for a missing character, or a sequence of other characters. These all show as the correct emoji when running iOS 12.1 or above. One of the most prominent additions in this release are four characters which permit hair color options for red hair, curly hair, white hair, and no hair. 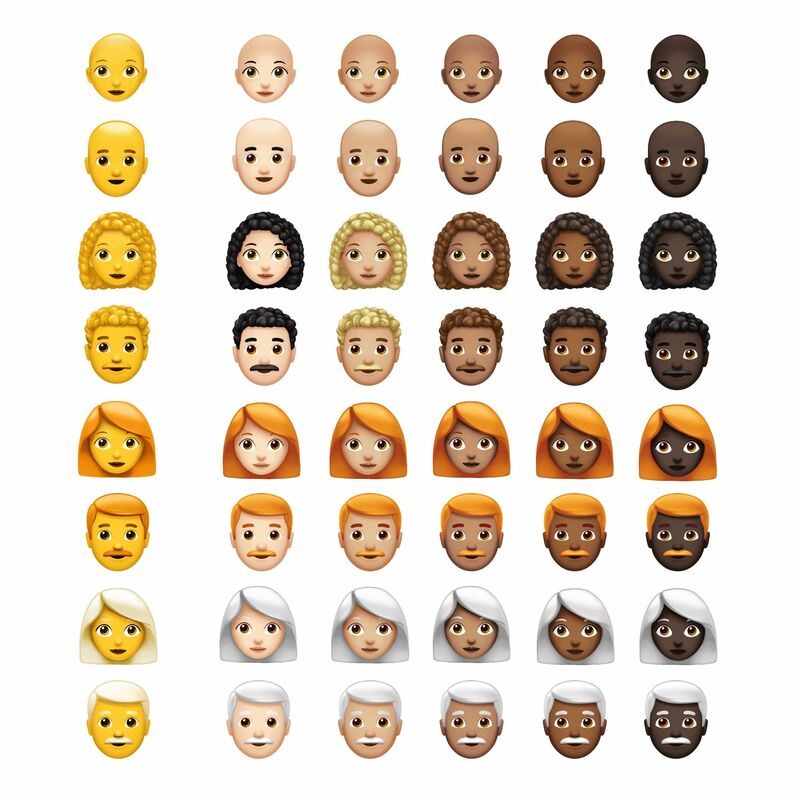 In Emoji 11.0 these form sequences that permit a woman or man to have these hair colors. Worth noting is that these aren't the same as the existing skin tone choices, which allow any emoji to be modified. Above: Hair color options in iOS 12.1. Images: Apple / Emojipedia composite. One benefit of this is that, for instance, the person with white hair or with curly hair can have any skin tone. A drawback is that no options exist for a redheaded runner, a bald bride, or a curly-haired judge. iOS 12.1 is in beta now, with a public release expected by late October or mid-November 2018. No official release date has been set at this time, and as with any beta, designs shown here are subject to change prior to a final release. These same new emojis will also be available on macOS, watchOS and tvOS in 2018. View details of this release from Apple or browse Emoji 11.0 for full details of this 2018 release from Unicode.